Printable: Must present the printed coupon or show on mobile phone, ID is required for proof of birthday. Print a 20% coupon for Denny’s restaurants instantly after sign up. If you don’t get it right away you will be the first to know when they are available through out the year. You don’t need to print a coupon for this offer, its just a reminder to let you know that kids eat free at any denny’s restaurants every Tuesday’s from 4pm to 10pm. 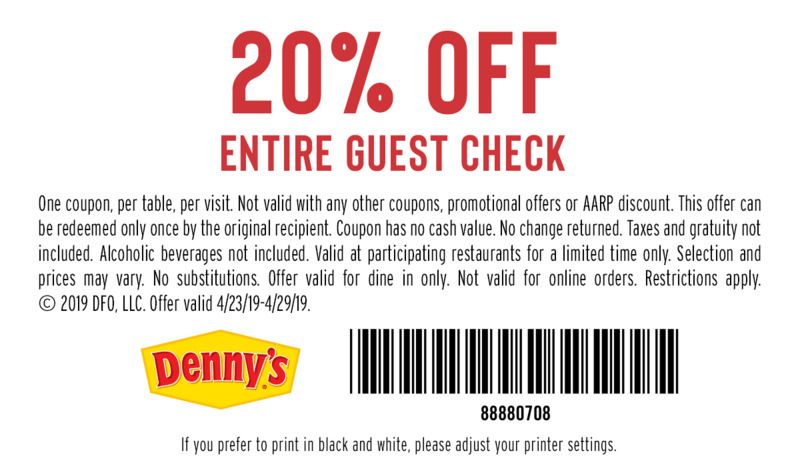 Printable & Mobile: Visit Denny’s with this coupon and get 10% off your entire check. One coupon per table, must present or show coupon to your server before ordering. Get a free banana split with 2 entree purchases. Must present the printed coupon and ID for proof of birthday. Stop by your local participating Denny’s restaurant to receive 50% off coupon ($19 value) for one child’s admission with purchase of one adult admission. Print coupon for a buy one, get one entree free with purchase of two beverages. Denny’s is a franchises family-style steakhouse restaurant that offers fast-food which includes, subs, clubs, salad, T bone steaks, and burgers. For a hearty meal that’s available 24/7, visit Denny’s. “America’s Diner” is popular for its around-the-clock service, delicious breakfast foods, and classic American lunch and dinner favorites. Just like Denny’s is always open, we don’t stop serving up the best in Denny’s coupons so you can save. We are traveling from UK to Las Vegas in 1st May 2016, and would like to receive your coupons as we are a group of 12 and visit Denny’s every year we are in aLas Vegas, LA starting 1st May to 7th may, can you help, we are booked with Virgin staying at the Tropicana hotel, I gather your restaurant is right next door is that correct? I tried to cash in my 20% off coupon with my phone. What difference does it make if it’s on paper? I can get on a plane without paper. . .that was a travesty of a breakfast!